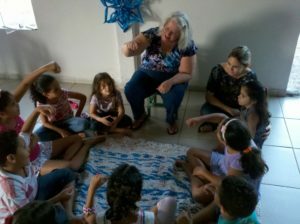 This is the Third story in our Celebrating 10-Years of Ministry in Brazil. It is often said that when we look back into our past history, even back to the beginning in the Old Testament of the Bible we can better see with confidence why it is so important to trust God enthusiastically with our future. I agree and that’s why we are writing this series. 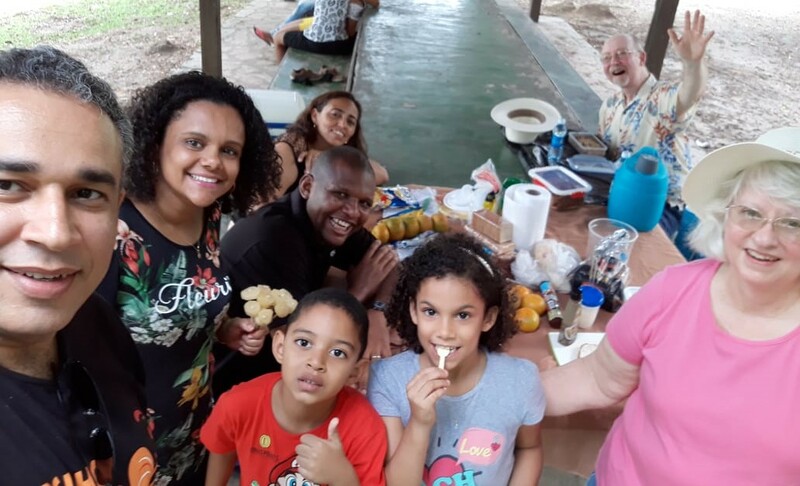 When we first heard God’s call to be missionaries in Brazil we were in the midst of our theological seminary education at Trinity School for Ministry in Ambridge, PA. It has been more than 10-years now and we are still learning why God called us here to a community in the upper Northeast corner of Brazil. Learning to speak Portuguese was the farthest thing from our minds as we pondered this calling to Brazil. In my opinion Portuguese is a language with far more rules for pronunciation and grammar than our native English and perhaps even a few more than the Hebrew and Greek we studied in seminary. Now that we have become permanent residents in Brazil for the past two and one half years, learning and using exclusively this beautifully sounding Romance language has become one of our top priorities. However even in a place where Portuguese is the national language there is a growing number of Brazilians more interested in practicing their English with us than helping and occasionally correcting our conversational Portuguese. There are many occasions when I will be conducting my end of the conversation in Portuguese while my Brazilian friend will be conducting their end of the conversation in English! Our first “Cell Group” where the purpose was to foster a sense of belonging (I hate this photo of the back of my head…but…Debby insisted it tells a story). This question has added significance when you factor in that our five adult daughters, son-in-laws, and eight grandchildren reside thousands of miles away on a different continent in the United States. 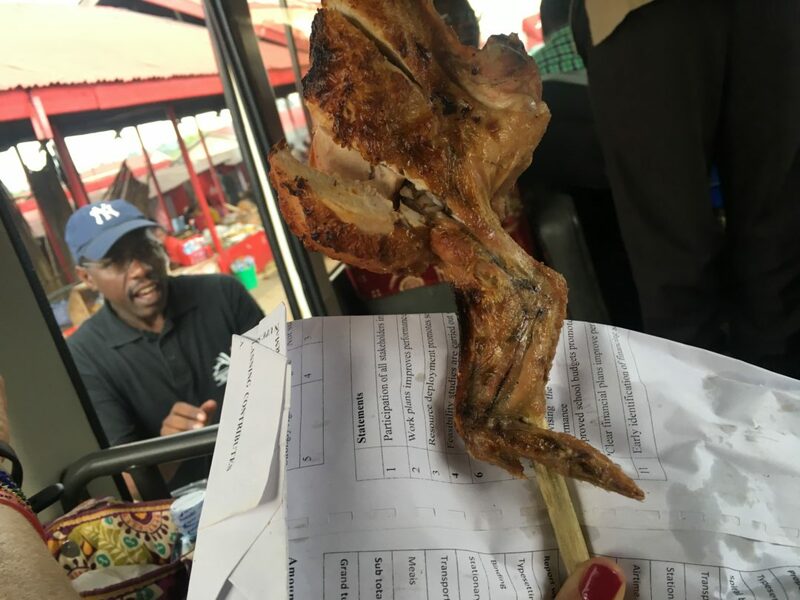 As we did our analysis there was one common denominator that emerged. It was not our ideas, programs, preaching or teaching that most impacted life change for the better. It was our mere presence and the building of personal relationships that provided the catalyst for change. God invests in us with His presence. Our living God, creator of all things, made the ultimate sacrifice so that we can live in the presence of God, Father, Son, and Holy Spirit for eternity. In return God asks only that we return to God the first fruits of our time, energy, labor and our wealth. Debby investing time in building relationships making soup twice a month for the neighborhood. Debby and I in reflecting on our rearing of five daughters, for example, have learned the importance of simply being present in the lives of our children was the greatest gift. The culture of this world talks about the importance of accumulating money and making investments with it for the future. We have learned that the best return on investment occurs when one person invests their life in the life of another person. If time is a gift from God, as many say it is, then isn’t reasonable to conclude that we should return the first fruit of this gift by paying it forward by investing our life in the life of another? We submit the answer is yes! Let me recount one of many examples of a return on investment as a result of investing our lives in the life of another. Each week our church meets in small “cell” groups to foster in each person a sense of belonging and to discuss the life application of the sermon we heard on Sunday. Our current cell group meets in the church. During one such meeting, one of our members from the neighborhood, Amanda, a mother of four children, made reference to a sign hanging in our church that referenced the growth that takes place in cell groups and personal discipleship. Amanda then said she now feels like she and her family belong and she wants to be discipled. Turning to Debby, Amanda asked Debby to disciple her. The look of surprise and joy on Debby’s face and Amanda’s face when Debby said yes, says it all. I enjoyed my time as a member of the local Curves fitness center in Ambridge, PA, , owned by Whitney Gresham. The camaraderie, health benefits, and community involvement was very appealing. Twice a year food drives have been held to bring donations to local food donation centers. Some years ago, a knitting class was held at Curves to teach how to make knitted yarn squares for a patchwork afghan blanket. The blankets were raffled off to raise funds for Relay for Life, a cancer fundraising event. Then after a devastating hurricane in Haiti, a class was held at curves to learn how to make “plarn” which is yarn made from plastic grocery bags, and then crocheted into large mats. 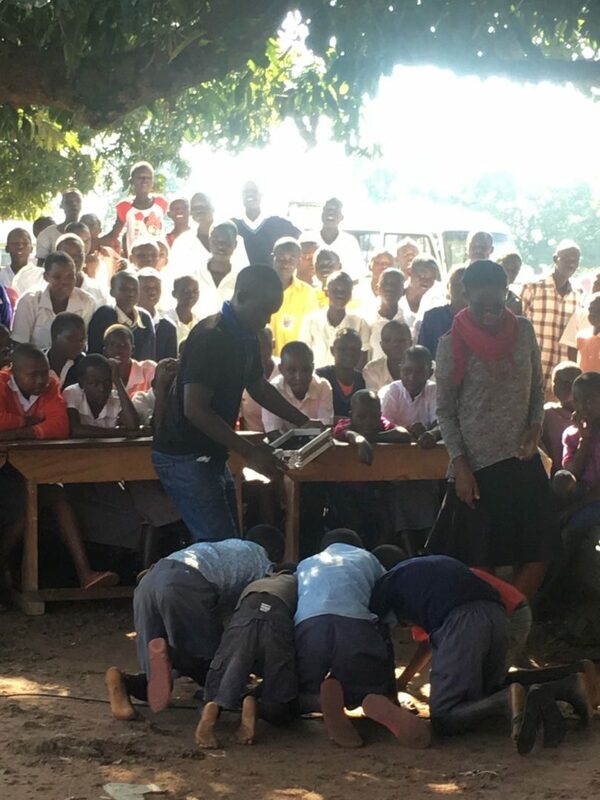 The mats were shipped to Haiti and used as sleeping mats for children orphaned by the hurricane. Handmade small bedside plarn mats continue being made today as an ongoing project for American service men and women serving overseas. 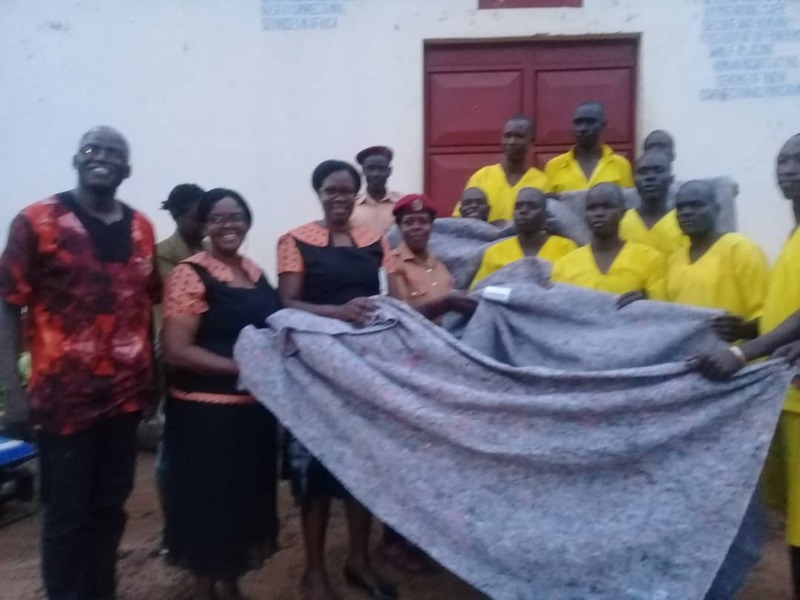 Recipients of these foot mats have written to express their gratitude for having a mat to scruff the sand off their feet before getting into their bunk. 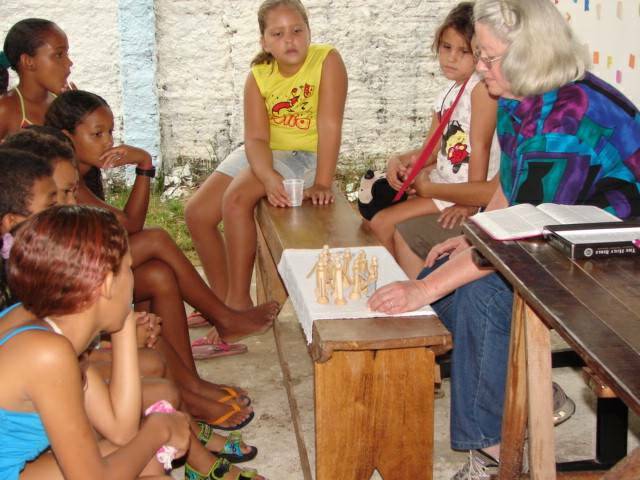 This Ambridge, PA community outreach benefitted our ministry in Brazil as well. Some of the large mats were not the specified size needed for sleeping mats, but were perfect for use in Brazil. These large colorful plarn rugs were stuffed into our suitcases and brought to Brazil. The plarn rugs were distributed to various churches and used as floor coverings in classrooms for children’s story time during Christian Education classes, and in individual homes in neighborhoods where churches had outreach ministries. Many of these homes had a combination of dirt and rough concrete floors. 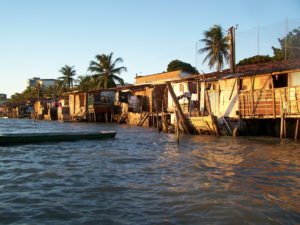 This was a Compassion Ministry neighborhood in Cabedelo, Paraiba, Brazil. A Ministry founded by Bishop Marcio Meira and his wife Pastor Linda. 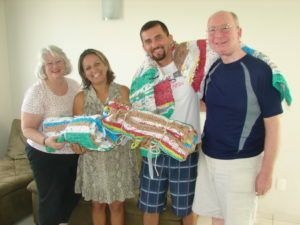 Then Pastor, now Diocesan Bishop, Marcio Meira and his wife, now a Pastor, Linda receiving Plarn Rugs for the families of their Compassion Ministry in Cabedelo, Paraiba, Brazil. 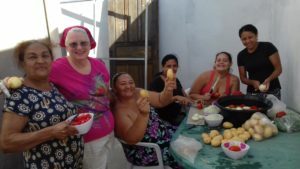 Currently, I now have plans here in Brazil to involve the wider local community in the teaching of how to make plarn from plastic grocery bags for a variety of items, from story mats to women’s purses. I will write more about this in future newsletters as this aspect of our mission in Brazil unfolds. Like building blocks laying the foundation for the next level, each step led to the next. 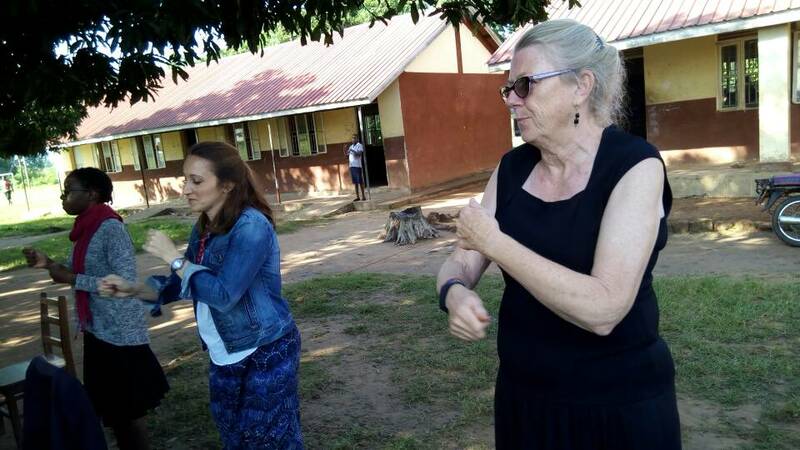 First I attended a seminary level Christian Education course which led to a 3 day Christian Education seminar on a Story telling method using simple manipulatives. In 2008, I was then invited to present an overview of this curriculum during a Christian Education Seminar for the Diocese of Recife, Brazil. 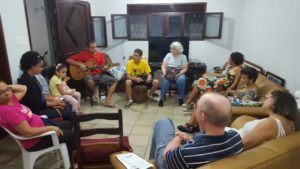 Those in attendance were eager to use the story telling method in their parishes, but it was not available in Portuguese. While preparing for that first overview presentation in Brazil the husband of our host family suggested I use Google Translate first and then have it reviewed by someone who spoke both Portuguese and English well. 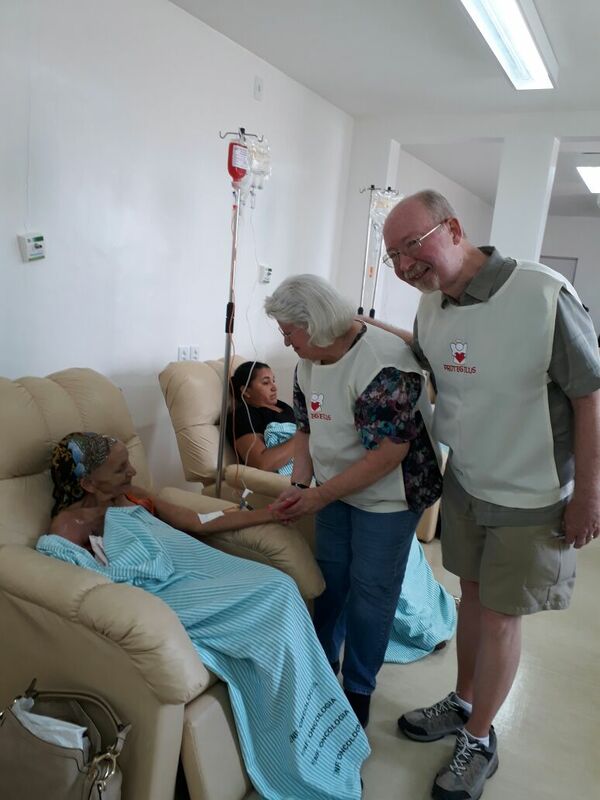 We knew just the person; a SAMS-UK missionary in Joao Pessoa had the skill and the time to help me. The next step began in the USA, translating the actual curriculum. With the help of two dedicated woman who knew English and Portuguese and many Saturdays, myself, Ivy Lacerda, and Debora Wortham, worked out a plan and set to work. We would prepare a 6 to 8 story curriculum that I would present in a Saturday workshop in Brazil. First the Advent/Christmas stories were presented, then the Lent/Easter stories, then Old Testament desert stories and New Testament stories, then Liturgical Action stories. It was a 2 ½ year project. Upon arriving in Brazil for each three week mission trip the next step of preparation was the fabrication of story materials using local resources. A “Kit” was made for each workshop participant to use in their individual parish. During the workshop each participant learned the stories and how to present the materials with voice and action skills to engage the child’s imagination. Sometimes Ron would comment “I just come along to carry the luggage, Debby is the rock star”. The Challenges: Each story needed to be rewritten to translate for a different culture, void of any Northern Hemisphere references. Time is not measured by seasons in Brazil, idioms do not translate well, and the many ways people approach daily life vary by culture and sometimes neighborhoods. There were no “Big Box” craft stores, so shopping for materials was a time consuming adventure and labor of love. 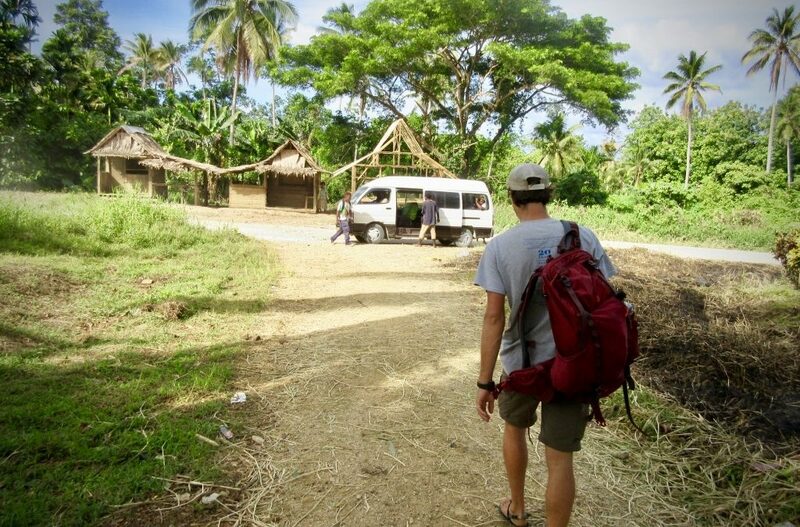 In my previous blog entry I gave an abbreviated account of some of what I did during my seven-month assignment to the Solomon Islands. 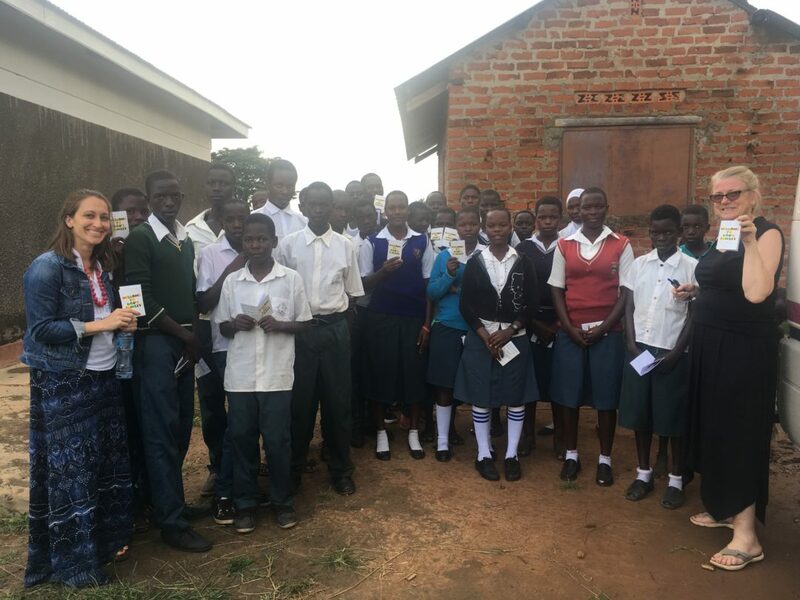 I returned home to the USA three months ago and set about transitioning to the “next thing.” As I transition, I thought it would be useful to readers of SAMS’ blog to learn about what I will be doing next, and more importantly, why the SAMS Bridger program has been such a helpful component of my discernment process. I should add that I am in no way under compulsion by SAMS staff to write this blog entry. The opinions and thoughts expressed here are my own, but I hope that they will be an encouragement to SAMS staff and supporters. Shortly after returning to the USA I married my long-time friend Kyria. You can read about her life and work on her blog. The two of us met as volunteers at Uncommon Grounds Cafe in 2010. 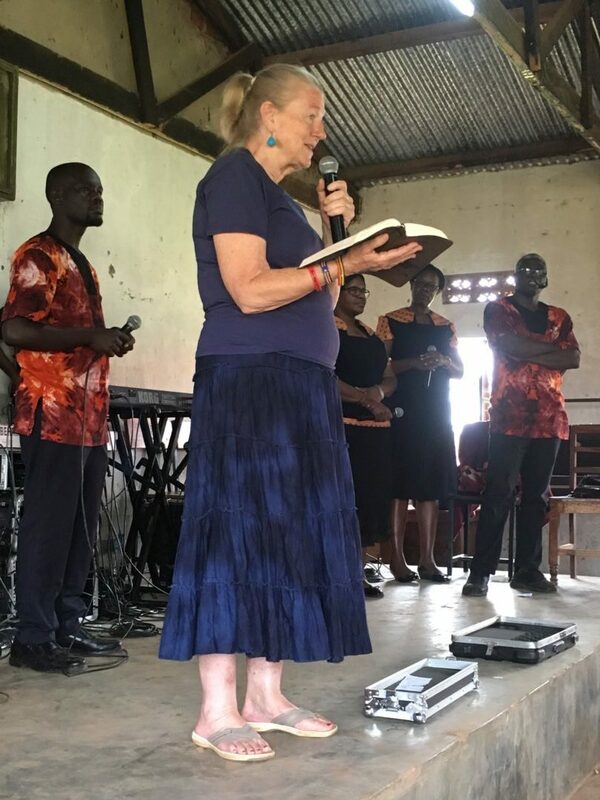 Since then Kyria has been serving as a long-term missionary with Mission to the World (MTW) in West Africa helping with Bible translation research, and in the United States receiving training at the Graduate Institute of Applied Linguistics. As of our marriage we have begun transitioning into the MTW family as a married couple. We don’t know where God is calling us to specifically, but we have expressed our willingness to serve in a majority Muslim context. We hope to combine our diverse gifts and experiences and return to international work sometime in 2019. Over the next year we will be exploring potential field locations and continuing to raise support. You can partner with us by giving by following this link (please note: for security reasons our number shows up, 13703, and not our names). 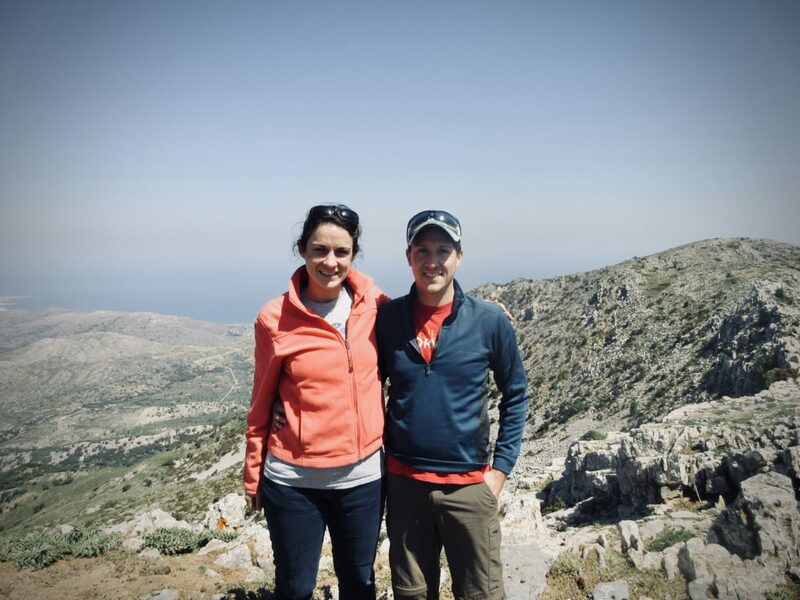 Kyria and I in Crete meeting with MTW international workers. How has the SAMS Bridger program helped prepare me for the road ahead? Before Kyria and I were going to get married, we knew we would be facing roughly seven months apart as she conducted literacy research for her Master’s thesis. I set about thinking of ways to utilize the time to get myself some further training and experience working internationally. 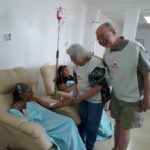 I had finished my MAR from Trinity School for Ministry, and had several years experience working with faith-based non-profits in the USA, but I only had short-term experience serving internationally. That’s when I was reminded of the SAMS Bridger program. Instead of a short-term trip, the Bridger program offers highly flexible opportunities ranging from 1 month to one year. This allowed me, with some advanced planning, to schedule an internship during the time my fiance was away. 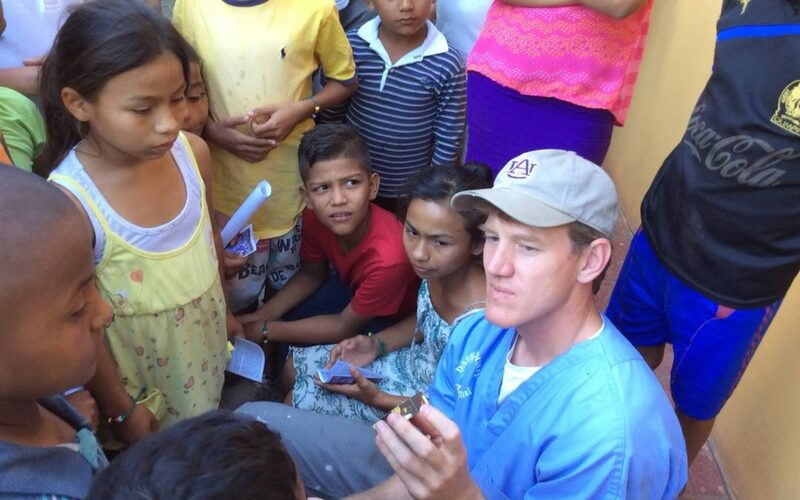 SAMS Bridger program involves mentoring for individuals seeking to explore missionary service as a vocation. This was a very big draw for me. My Bridger mentoring experience taught me a lot about team dynamics, met and unmet expectations, and the daily challenges of international life. I formed close relationships with my teammate/mentors that will last for a lifetime. My Bridger experience was highly personalized–through conversations with my mentors before arriving in-country we found work that would utilize some of my previous skills and experiences. 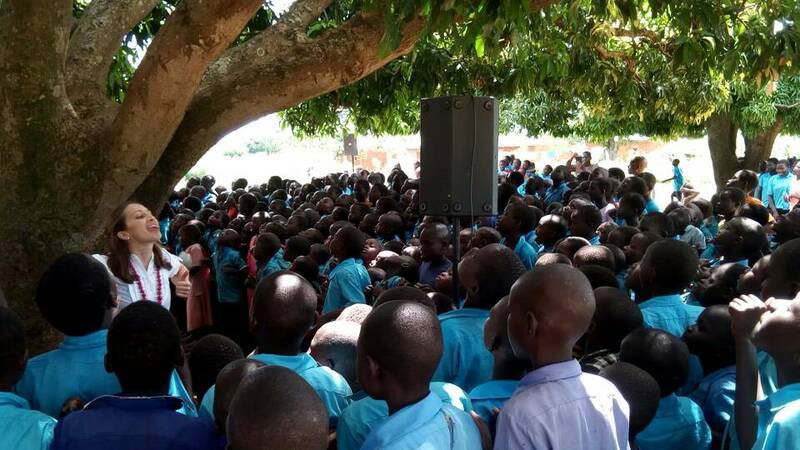 I also had opportunities to try new things such as preaching and teaching cross-culturally. Every Bridger will have have a uniquely designed missionary experience. 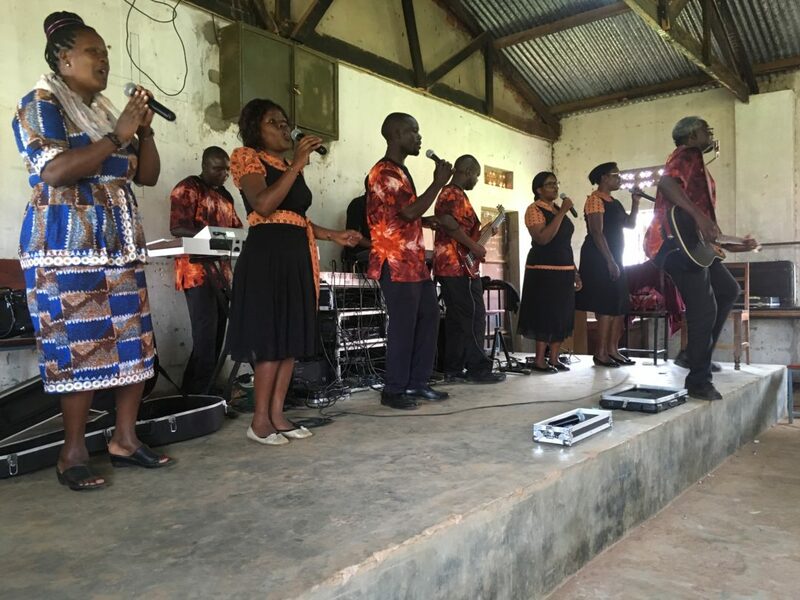 Beyond these program qualities, God’s providence was evident throughout my whole experience–from Bridger training, to support-raising, arrival in country, and returning home–God’s plan was continually confirmed in my being sent and my coming home. God raised up supporters. God kept me safe. God gave me the strength to preach, teach, and live. I may be transitioning out of the SAMS community, but I will never forget the experiences I had as a SAMS Bridger in the Solomon Islands, nor the genuine relationships I formed with SAMS staff. Moving forward Kyria and I hope to collaborate with SAMS workers wherever it is possible. Who is the SAMS Bridger program for? 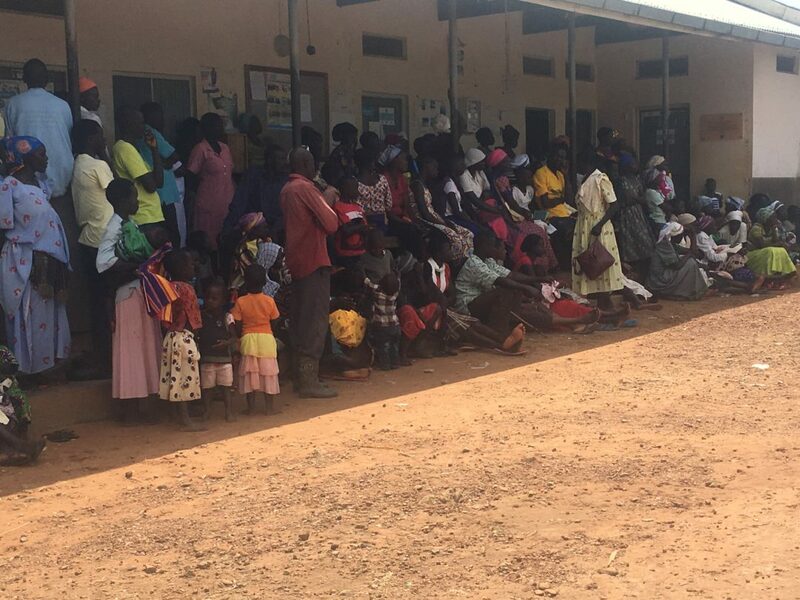 In the 9th chapter of Matthew we are told that Jesus went throughout the towns and villages, full of compassion, preaching good news and healing the sick. He told his disciples, “The harvest is plentiful, but the workers are few. Ask the Lord of the harvest, therefore, to send out workers into his harvest field.”(9:37b-38). If you are considering longer term missionary service, or if you have considered it in the past, then this is a program for you. Don’t let money be a worry that keeps you from pursuing a God gifted vocation. I think this is a program especially suited for college age (in between semesters), recent grads, graduate students, or even second-vocation adults. If you are interested in learning more about the program from me, or if you are a Bridger raising support looking for advice, don’t hesitate to email! You can also contact the Bridger program coordinator directly.